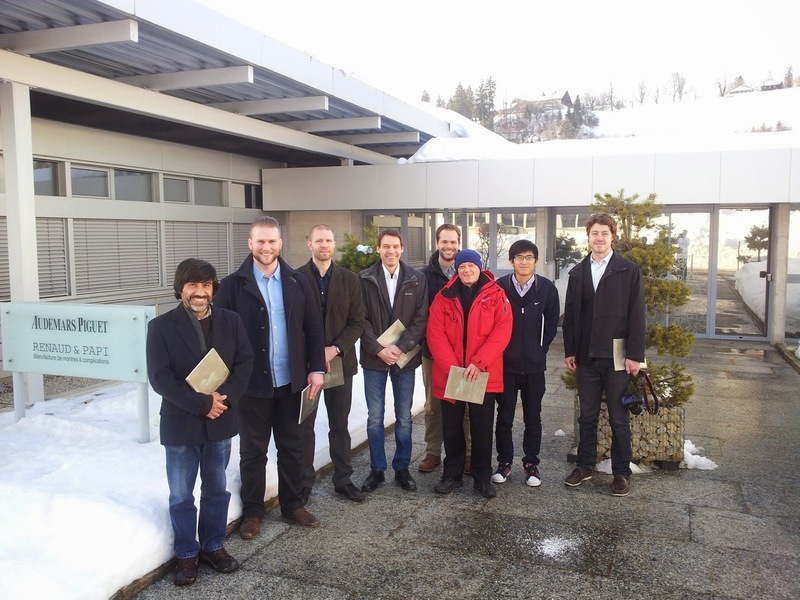 Last Friday, February the 13th, we were fortunate enough to be allowed to go for a visit to Renaud & Papi manufacture that is located only 250 meters away from the school. At the modest Renaud & Papi facilities many of the world's most exclusive and expensive watches are made for some of the most prestigious watchmaking houses, most notably Audemars Piguet which owns majority of the manufacture. We felt extremely lucky and privileged to go there and see how they make watches and to witness their talented watchmakers work on pieces that cost more than most cars and even more than some houses. We saw their training workshop and had a nice talk with the in-house teacher there. After that we walked over to the part making department where highly sophisticated CNC machines mill and turn the components from blocks of brass and rods of steel. Then we visited the surface finishing department which finalizes the rough components made by the CNC machines by polishing the parts and decorating them before the watchmakers receive the "movement kits" to clean, assemble, oil and adjust. That was the most interesting part of the visit, to see the watchmakers work on their benches with those complicated and highly decorated movements. The main challenge for the watchmakers is to make all the components, in some cases over 500 separate components, work in perfect harmony without leaving any traces such as scratches or dust. Very impressive stuff. As said before, some of the most exclusive and expensive watches in the world are built at Renaud & Papi. For instance, we saw this amazing watch being assembled and tested. This particular watch from Richard Mille costs more than $1.5 million. The movement is very special with some exotic materials and mechanism such as tourbillon and bridges made from sapphire. The case itself is made from a solid block of sapphire and is extremely challenging to make. It completely blew us away to see this watch live, it's intimidating and fascinating at the same time. We thank Renaud & Papi very much for inviting us for a visit, and what a nice visit that was! The teachers and students happy with the visit.